The Lady Clarets won 3-0 against Crewe Alexandra Ladies at Cumberland Arena on Sunday to clinch the FA WNL Division 1 North title, and a second-successive promotion, prompting jubilant celebrations. 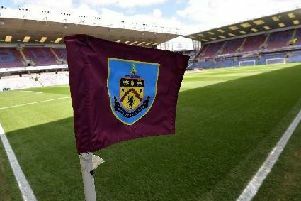 backing of Burnley FC in the Community. 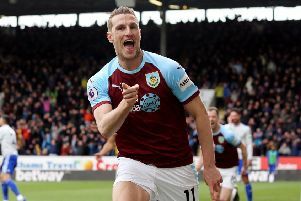 In the game, the Clarets made a determined start, though Crewe were playing a high defensive line, and early attempts at pressuring the home goal were stifled by the well-marshalled defence, springing the offside trap. Crewe pushed forward, and their player of the match Amanda Fallon was proving a threat. Clarets captain Jo Holt and fellow central defender Sammy Fleck contained her well and minimised her view of goal. The first Clarets; goal was not far away, and, on 10 minutes, Leah Embley intercepted in midfield and charged down the right wing before passing to Priestley, who calmly slotted the ball out of reach of the keeper, whilst evading a challenging defender, to open the scoring. The game swung further in the Clarets' favour with a second goal on 16 minutes. Embley’s pass to Sarah Greenhalgh on the right wing set her off on a forward run, before she shot hard and low from an angle. The home keeper Hannah Holloway dived to save but was unable to hold the ball and Priestley swooped in and slotted the ball into the net. Crewe had to defend hard to maintain the score as both Priestley and Greenhalgh posed a constant threat. However, they came close to being rewarded for their work rate when a forward move and shot from Bethany Grice had Bracewell diving to save at her right post. Close to half-time, both Burnley’s Vikki Eastwood and Greenhalgh had good shots on goal when the keeper was closing them down, but both were marginally high. Later, Bracewell was called into action to collect a high cross at her back post to deny Crewe strikers who closed in to intercept. At the start of the second half, the Clarets continued to pressure the home side and an extension of the score line looked most likely. Crewe however, broke forwards, and a ball into the Clarets box was chased by Fallon. Bracewell challenged her as she intercepted on the edge and caught her as she slid in. The referee awarded a penalty to Crewe and cautioned Bracewell. Undeterred, Bracewell read the situation well and saved the penalty when Fallon struck the ball towards her left post. The Clarets picked up the momentum again and Greenhalgh was rebuffed in a one on one challenge with keeper Holloway and Embley had a penalty shout turned down when her cross appeared to strike a defender’s raised arm in the box. The final goal on 72 minutes resulted from a Lizzy Hamer cross into the box, and Priestley evading the offside trap before she headed towards goal. Priestley chased the ball and quickly headed again, past Holloway and into the net. The Clarets were not able to add to the score in the remaining minutes as Crewe once again defended well and used the offside trap to see out the remainder of the game. In the dressing room after the celebrations, team manager Matt Bee and captain Jo Holt congratulated the players for their commitment throughout the season and the personal sacrifices in maintaining training schedules and team commitments. Burnley FC Women take a well-earned break over Easter but return to action against Newcastle United Women FC on Sunday, April 28th at Padiham FC’s Ruby Civil Arena. Kick-off is 3 p.m.